W elcome To Our Restaurant! Restaurant "Atrium" was opened on May 15, 2015. Restaurant "Atrium" has a unique design and a cozy atmosphere. 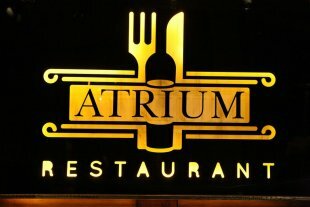 In "Atrium" you can taste Georgian and European dishes, as well as delicious steaks and pizza. The restaurant has a summer terrace. Summer cooling system effectively ensures your maximum comfort. You can also plan weddings and corporate events in the restaurant. P.S. Age Control/Persons under 18 years are not admitted. Alcoholic beverages will not be sold to persons under 22. The restaurant has dress code, its prohibited to enter Atrium in sports clothes..